For most of us who grew up obsessed with Tyler Perry movies, we can agree that there is no better experience, especially if you were looking for good ol' Madea to "slap back" and put some people in their place. Dark Tide: Kate Mathieson (Halle Berry) was once hailed for her understanding of the ocean’s most fearsome creatures, but her reputation is shattered when a diver under her command is killed by a shark. Now she gets a chance to redeem herself... in the deadly feeding ground known as Shark Alley. Tune in on Thursday 9 June at 14:30 CAT. Hancock: Not all superheroes strive to be musclemen in fancy outfits. This is one of the many themes tackled by a truly original story, with Will Smith and Charlize Theron in the leading roles. Hancock’s superpowers allow him to perform one good deed after the other, and yet he becomes the most hated man in Los Angeles because he is also a drunk who wreaks havoc “on duty”. A PR man restores his image, and their meeting leads to a startling discovery. On Thursday 9 June at 18:25 CAT. Bad Boys II: The crazy duo of Will Smith and Martin Lawrence return for this pulsating sequel. This time the two loose cannon cops are investigating the shipping of Ecstasy into Florida. Airs on Friday 10 June at 20:00 CAT. Madea’s Big Happy Family: Comedy and tragedy are blood brothers or, in the case of Madea, soul sisters. It is the fifth instalment in the Madea series. Madea’s niece, Shirley, received devastating news concerning her health, which she needs to share with her three grownup children, but they are preoccupied with troubles of their own. Madea has to step in and draw the clan together. On Saturday 11 June at 18:14 CAT. Diary of a Mad Black Woman: Tyler Perry, who brought us the inimitable Madea and all her laugh-a-minute films, started his movie career with this film about infidelity. Friends are shocked when Helen and Charles’s seemingly perfect marriage falls apart due to his unfaithfulness and abusive behaviour. A deplorable turn of events shows Helen that the time has arrived for her to take the driving seat. Airs on Saturday 11 June at 20:00 CAT. Coach Carter: Based on a true story of high school basketball coach Ken Carter, who refused to short-change his players in terms of receiving a good education. Samuel L. Jackson plays the title role of Coach Carter who returns to the school he attended and represented on the basketball court many years ago. He is shocked by the players’ rudeness and poor academic performance, and draws up a code of conduct. Nobody thinks he will stick to it. Bad mistake! Airs on Tuesday 14 June at 14:00 CAT. Trevor Noah: It’s My Culture: Trevor Noah’s stand-up routines have won wide acclaim by steering clear of stale traditional gags to create something totally fresh and original. In South Africa, even the weirdest actions can be defended... as long as one can prove that they fit into one’s cultural framework. Trevor Noah investigates – and sends up – the cultural eccentricities found in Zambia, New Zealand, London and New York. On Thursday 16 June at 18:45 CAT. Ride Along: A blockbuster buddy-cop action movie with comedian Kevin Hart as a rookie who wants to impress his future brother-in-law –played by formidable rapper and movie producer Ice Cube. Security guard Ben finally thinks he’ll earn the respect of his girlfriend’s brother, James, a detective with the Atlanta Police Department, when he joins the academy. But to prove how tough he is, Ben has to go undercover with James while he investigates a dangerous smuggling ring. On Friday 17 June at 20:00 CAT. Think Like a Man Too: This goofball comedy about friendship and marriage reunites the cast of the hugely successful Think Like a Man, in a turbo-charged sequel. When you are in a relationship and you attend a wedding in Las Vegas... well, the subject of marriage is bound to come up sooner rather than later. By the time the credits roll, you’ll know for sure whether it is really a good idea for a woman to think like a man. On Saturday 18 June at 20:00 CAT. Madea’s Witness Protection: Madea is back in what her creator, Tyler Perry, who also fills the lead role, describes as the only all-out comedy he has ever made. Yes, there are always laughs aplenty, but this time round his only target was the funny bone. George is a financial guru at an investment company, which, it turns out, is nothing more than a front used by the mob to fleece investors. He has to go into witness protection... and the cops feel Madea’s house in Georgia is the perfect hideaway. Chaos cannot be too far off. Airs on Sunday 19 June at 15:15 CAT. 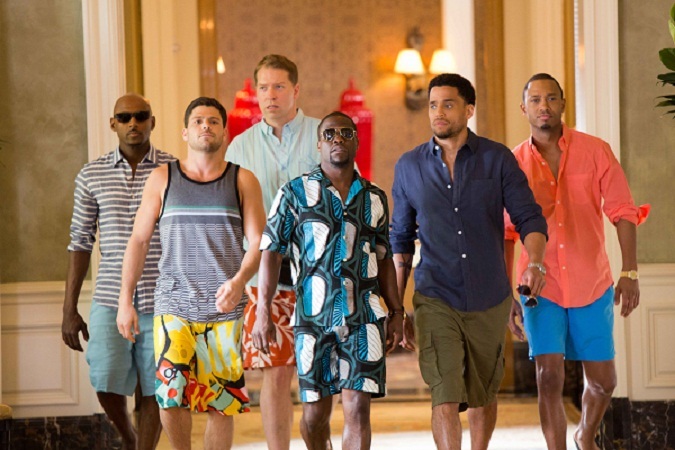 The Best Man Holiday: A group of friends meet again after a long separation and reminisce about the “good old days”. Harper Stewart (Taye Diggs) is a struggling writer in financial strife – and his wife, Robyn (Sanaa Lathan), is almost nine months pregnant. He contemplates a devious deed that will solve most of his problems. But at what expense to his conscience? Airs on Tuesday 21 June at 20:00 CAT. Good Deeds: One-man film factory Tyler Perry is at it again, producing, directing and writing a touching romantic drama. Oh, and he's also the male lead. What will it take to jolt a staid and successful businessman out of his deadly dull daily routine? Odds are a feisty single mother on his company's cleaning crew will turn his life around without even trying. Airs on Wednesday 29 June at 12:00 CAT. Fallen: Double Oscar winner Denzel Washington stars in a supernatural thriller that became notorious for being the only Turner Pictures film to a receive an R rating in America. Detective John Hobbs attends the execution of a serial killer he had caught, and is pleased to have cleared the street of this menace. But soon afterwards the killings resume... and he is taunted by strangers possessed with the spirit of the fallen angel Azazel. Airs on Wednesday 29 June at 21:45 CAT.